Microsoft’s Bluetooth Mobile Keyboard 6000 is like Apple’s Wireless Keyboard ( ) in that both keyboards are compact, both have low profiles, and both use Bluetooth. The Keyboard 6000 is a good keyboard for packing in a backpack or suitcase, but you’ll have to make a few adjustments when using this keyboard on a Mac. Measuring 14 inches wide and 6.5 inches long, the Keyboard 6000 compares in size to the 11-by-5.25 inch Apple Wireless Keyboard. The Keyboard 6000 doesn’t rise up as much as Apple Wireless Keyboard—the top of the Keyboard 6000 rises a barely-noticeable .5 inches, while the Apple Wireless Keyboard rises .75 inches. The near flatness of the Keyboard 6000 makes it easy to stash; it fit nicely with my 15-inch MacBook Pro in my backpack’s padded laptop compartment. The low profile didn’t bother me while typing, but if you need a higher angle, you’ll need to use something to prop the Keyboard 6000 up—it has no way to adjust the keyboard’s height. 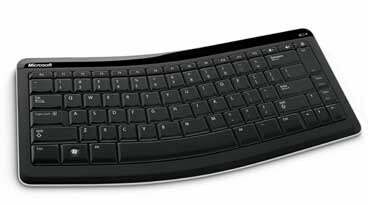 The Keyboard 6000 has what Microsoft calls the Comfort Curve that puts the keys at a better, more natural angle for your hands. It takes some time to adjust to the Keyboard 6000’s curve, especially if you’re used to straight keyboards like the Apple Wireless Keyboard. I liked the feel of the Keyboard 6000; it has a lot more spring than Apple’s keyboard, which makes my fingers sore after a day of use. The most annoying aspect of the Keyboard 6000 is the inability to customize any of the keys. Microsoft doesn’t include any Mac software, and the downloadable Microsoft IntelliType Pro software didn’t work with the Keyboard 6000. The Keyboard 6000 doesn't have a Command key; there are Alt keys where Mac users are used to having Command keys, and there's a Windows key to the left of the Alt key on the left side of the keyboard. By default on the Keyboard 6000, the Windows key acts as the Command key. You can change this in the Keyboard system preference; under the Modifier Keys section, change the Option key setting to Command, and the Command key setting to Option. This will set up the Command and Option keys to familiar locations for Mac users. When using the Keyboard 6000, the F-keys at the top of the keyboard support the F-key functions of the OS. You no longer have the ability to make adjustments for screen brightness or keyboard backlighting on the MacBook Pro. The Keyboard 6000 has volume keys and a mute key on the upper right. There’s a Delete key under the mute key and next to the Backspace key; under the Delete key is a Page Up key, which is next to the Enter. I often pressed the Delete key when I wanted to press the Backspace key, and the Page Up key when I wanted to press the Enter key—frustrating, to say the least. Keypad for the Bluetooth Mobile Keyboard 6000. The Keyboard 6000 comes with a keypad, which is handy for data entry. Interestingly, Microsoft includes a protective cloth pouch for the keypad, but not one for the keyboard. The Keyboard 6000 uses Bluetooth, and if you have a Bluetooth built-in to your Mac, you don’t have to plug a transmitter into a USB port like you would with an RF device. However, it takes several seconds for the keyboard and keypad to reconnect after idle. The Bluetooth Mobile Keyboard 6000’s thinness and light weight make it ideal for travel, but it’s a basic keyboard that will require you adjust to its design and layout. 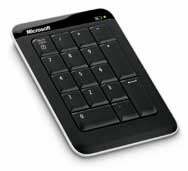 The keypad is helpful for anyone who frequently works with numerical data.